The tradition of serving mint sauce with lamb comes from England, and it dates back to a time when lamb was significantly more gamy and fatty as compared with today. Moreover, a typical recipe for preparing a leg of lamb involved immersing it in boiling water for about an hour and a half. Let's just say that the fetid, unctuous mass of meat that was served a couple of hundred years ago bore little resemblance to the lean, delicately flavored meat we're accustomed to. In any case, the lamb was generally slaughtered in the spring, which is when mint proliferates, and a sweet, tangy, minty sauce was just the thing to provide some relief from the heavy, muttony-smelling meat that graced people's tables in days gone by. How we got from mint sauce to mint jelly is another story. Mint jelly was popularized in the mid-20th century in the United States, likely in response to the large number of U.S. servicemen returning home after being stationed in the UK, where over the course of their four-year sojourns they'd been exposed to life-altering quantities of mutton—served, of course, with its now-indispensable mint sauce. Jelly, you see, is comparatively shelf-stable, which enabled companies like Smuckers to mass-produce and distribute jars of mint jelly to meet the demand for some sort of minty condiment to serve with lamb. The reason for the Day-Glo color—well, your guess is as good as ours. Nevertheless, mint and lamb go hand in hand—whether because of tradition or because it really does provide a refreshing contrast to the flavor of lamb, which although it is milder than than it was 100 years ago, still has a distinctive flavor (especially the grass-fed kind). 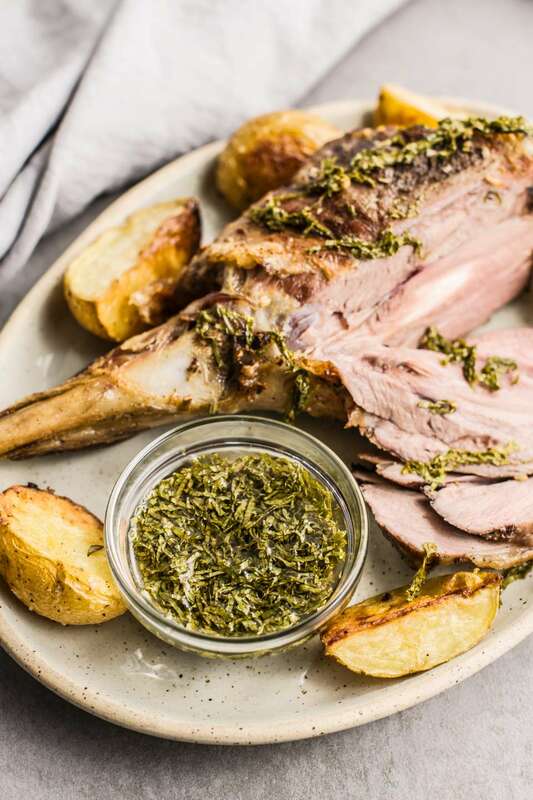 In any case, this mint sauce is a perfect accompaniment for a roast leg of lamb. You can make it in minutes, but for best results plan on letting it sit for an hour or so to allow the mint flavor to fully infuse the sauce. The base of the sauce is a white wine vinegar that will be reduced by half. So the better quality of vinegar you start with, the better your mint sauce is going to be. But whatever you do, don't use plain distilled vinegar. Turn off the heat and let the sauce cool for 5 minutes before adding the mint leaves. Give it a stir. You can transform this mint sauce recipe into a mint jelly recipe by decreasing the vinegar to about 3 tablespoons and adding two cups of water along with about 1/4 ounce of powdered pectin. Simmer for about a minute, then cool and chill overnight. You could also add a drop or two of green food coloring if you prefer a greener jelly. In fact, you could do this even if you're preparing as a sauce rather than a jelly.